Black and white negative of a photograph of a panoramic photograph of Whitby taken from the water tower on Euclid Street. 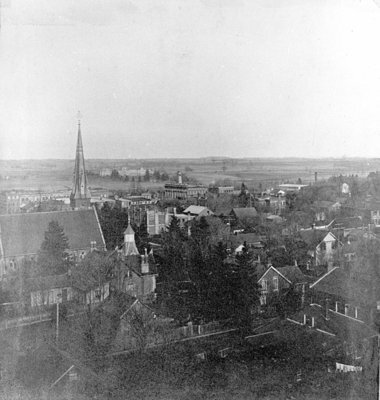 View looking south-east shows All Saints' Anglican Church at left and the Ontario Ladies College in the background. This is the centre image of a three-part panoramic photograph. Panoramic Photograph of Whitby Part II, 1906, George I. Wilson, Whitby Archives, 22-000-004. Copied by Thomas Bouckley Collection.